Notes/comments: You can also look at the original pencil sketch. Notes/comments: The scenario I imagined for this one was something along the lines that Harry got captured, lost his wand and now makes a desperate attempt to escape by surprising Voldie with his animagus form and tries to incapacitate him with the venom to get away, that's why he's trying to kick him... You can also look at the original pencil sketch. 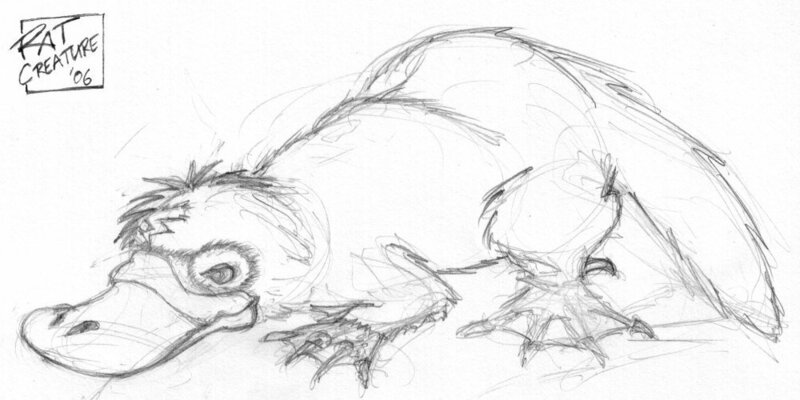 The animagus challenge is turning out to be fun, I now have two rough sketches, one of plain Platypus!Harry, and one with fierce action-platypus fighting Voldemort. (He is sort of trying to kick him with the hind leg, I guess the scenario would be something like he got captured, lost his wand and now makes a desperate attempt to escape by surprising Voldie with his animagus form and its venomous ankle spurs or some something... *g*) Of course I still have scan them, clean them up and color t least as long if not longer than the first sketch. I am totally in awe of those people who can draw something right into artpad and it looks good.